Old Faithful is the most popular of the many geysers in the area. Old Faithful biggest may not offer the largest eruptions of all geysers, but it erupts more frequently. Each eruption lasts as long as five minutes and climbs as high as 184 feet. It recharges every 45 to 110 minutes and spurts up to 8,400 gallons of water. 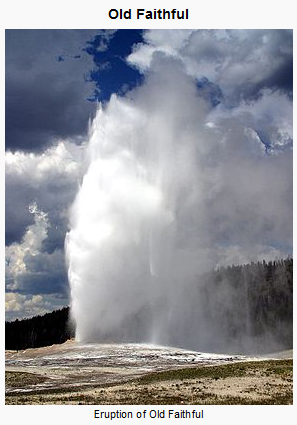 FACT: Old Faithful has rarely missed an eruption in over 120 years of recorded history. girl parang ito yung fineature sa 2012 na movie di ba, biggest erruption daw ever? ito ba yun? I never heard about this until today hahaha...outdated si lola but I fond of reading current events daily. Loyal na loyal naman itong place na ito hehehe..